Colorado MTB trip September 2015!!! Join us on this fantastic trip to Colorado!!! Jonathan, Gina, James, Mike, JP, Travis, Chris, Kerry and Jason just got back from the Chihuahuan Desert Festival in Lajitas West Texas. This is the fourth year the the club has gone to this fantastic event. On the banks of the Rio Grande! Most of us left College Station on Tuesday and started the 10 hour drive to Lajitas in Very cold weather. There were was a large ice storm west of Austin and temperatures fell to 25 F at one point. This made for difficult driving conditions and did not bode well for a camping trip. Luckily the temperature in Lajitas was slightly higher and it was dry. The weather for the rest of the trip was fantastic with dry trails, sunshine, and temperatures in the 70s during the day. 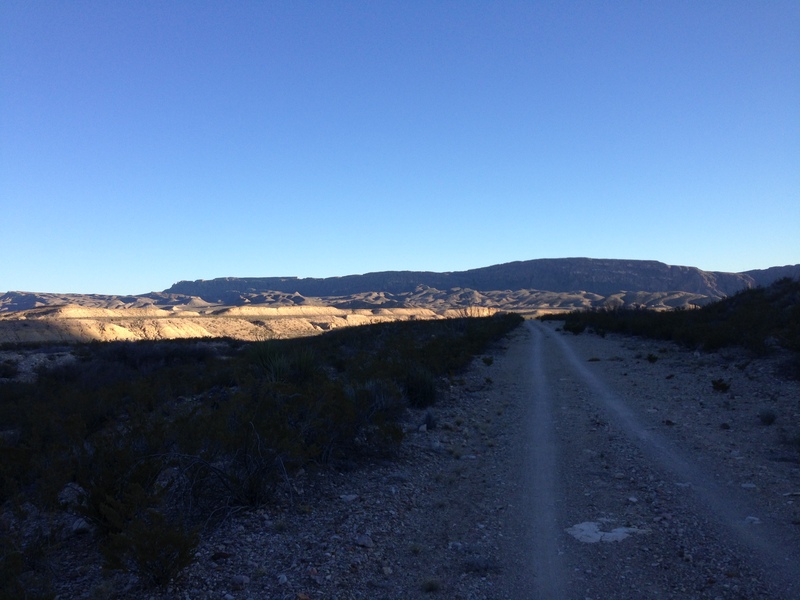 We all had a great time riding the awesome flowy trails in Lajitas, the rocky climbs and descents of Big Bend Ranch State Park, and the awesome scenery of Big Bend National Park. Four club members rode the awesome 60 mile IMBA Epic ride in the State Park and lived to tell the tale! Travis and JP enjoying the sweet trails! As well as some great riding there was also a lot of delicious food to be had! Highlights included the 1 pound Diego burgers complete with 2 fried eggs and bacon at the Starlight Theater and Gina’s Fajita feast on Saturday night! 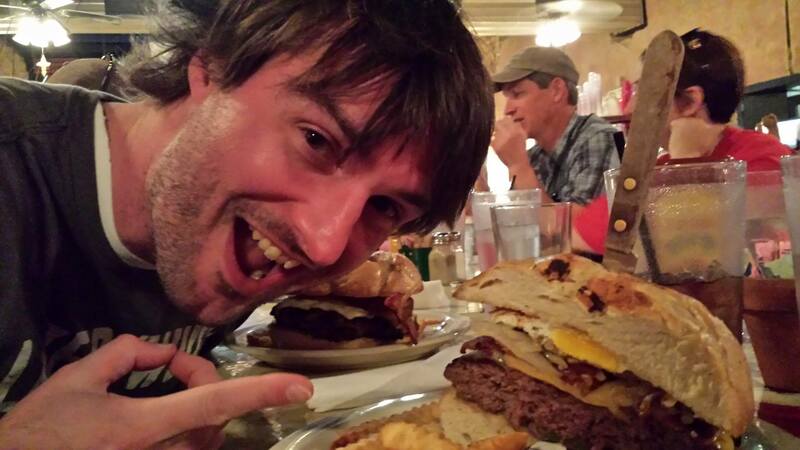 Jason tackles the formidable Diego Burger! 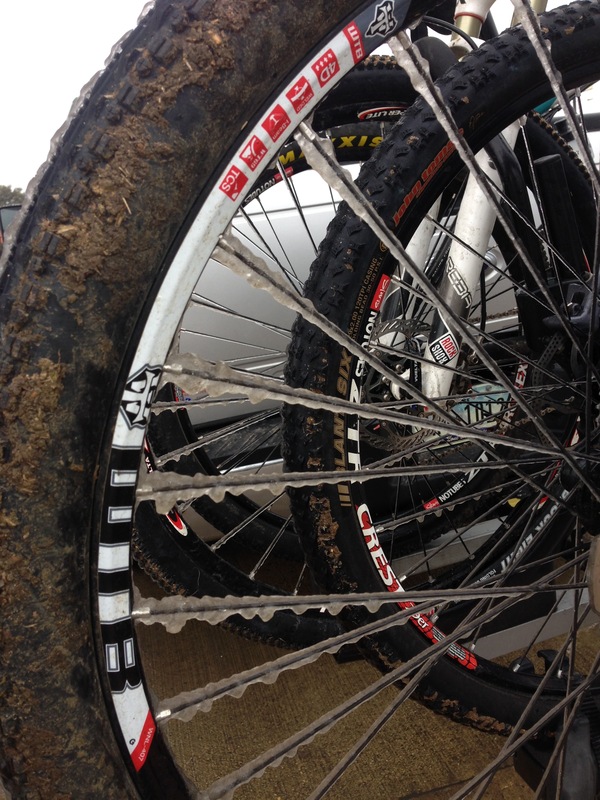 On Sunday we retuned to College Station with dirty bikes, sore legs, and big smiles. Now we are all counting down the days until next year’s event! The 3rd annaul Chihuahuan Desert Bike Festival has come and gone and did we have have a GREAT time this year. A total of 13 BVMBA’ers made the long journey to the Maverick RV Park in Lajitas, Tx. to set camp for the next 4 days of biking and fellowship. 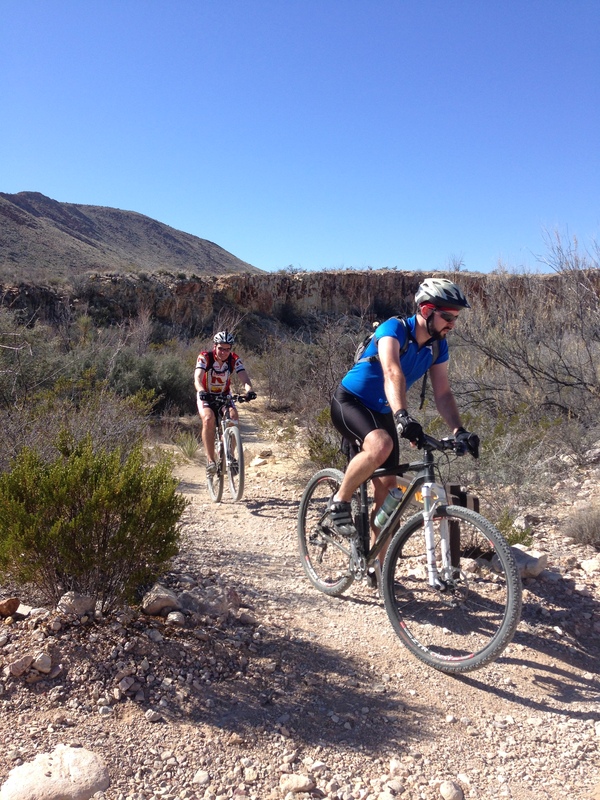 Day 1 of the festival was the famous Ore Road ride out to the Hot springs on East side of the Chisos Mt. We split in to two group (32 milers and 18 milers). It didn’t matter which group you were in because the outcome was an AWESOME day of riding. Back at camp we all gather for dinner and conversation about the day and somewhat get organized for day two. Day 2 started a little colder and windier than we all anticipated but quickly warmed up as Collin and Dana were kind enought to make pancakes and sausage links for the group. We still haven’t quite decided how to repay them back for that treat. Put we’ll start with a THANK YOU!! After breakfast several members of our group decided to rent demo bikes from Specialized. Boy did they get spoiled on the Lajitas trail on this day. Althouth we broke up into smaller groups we had another GREAT day on the trails. Day 3 was EPIC day. The majority of the group had the chance to ride all or part of what were the best trails of the trip (in my opinion). After another long day on the bike we all got ready to hit the Starlite Theatre for dinner. Day 4 was the end of the trip. Time to break camp, pack the vehicles and get back home. Short slideshow video of our trip. Another successful race for the BVMBA. Although some of our riders had a few bumps, bruises and sore spots we all left in ONE piece!!! James and Mark Munnerlyn got the short end of the stick when there 4 man squad was cut in half. None the less they both put in speedy times and finish with a total of 7 laps. I finished each lap well within my designated goal time. I only crashed 4 times during my time on the trails with a major wreck on lap 6. Felt really erie watching the rocks coming straight at me. I was able to do 9 laps putting me in10th place for my 2nd attempt at the 24 Hr race. But the highlight of the 24 Hr wknd was the Dream Team (Mike, JP, Kim and Ali). They competed in the 3-4 person co-ed and finished a solid 3rd place. Each member of the team pulled off some incredible times with some solid riding. CONGRATS to everyone!!! Mike, Joel, Ali, JP, Nicholos along with first time visitors James, Travis, Jason and Jonathan had the chance to ride the mountain bike trails at Camp Eagle. We all arrived at different time and unfortunetly not all of us had the chance to get a quick 6 mile ride in on Friday evening. But the trails were in GREAT condition. After our quick ride we all gather at the camp site for dinner and conversation. By this time everyone but Ali has made the journey to Camp Eagle. As the night progressed we started to worry a little since there is no cell service and the only internet service is at the camp headquarters. 30 more minutes we kept saying, “if she’s not here by then were going to sleep”. Well she make it with time to spare. All BVMBA’ers accounted for and now time to rest for Saturdays ride. The prelude to any group ride is always a fun sight to observe. No specified time to wake up, eat or even start riding. We’ll have to definetly work on this in the future. Just Kidding !!! Am I ??? Our goal for the ride – Make sure to hit every possible trail with no major injuries !! We all get organized and hit the trails. Mike leads the group starting off on the Fish Trail. Fish Trail is usually where most of the races at CE start and finish. From there we jump onto Duck which runs along the Nueces River and is the start of the North Loop. Two really cool section to get the legs jump started before we make the ascend up (Boot, Moon, Texas) to the 2nd highest point at CE. For the most part these 3 section have been slightly modified to keep you on your toes throught the challenging areas and still allow you to feel confident about your biking skills. We had several stop along the North Loop to make sure all riders were accounted for and make sure everyone was still feeling the energy to ride on. Time to descent down back to the Boot Trail to finish off the North Loop. The second half of the Texas trail is a nice technical switchback trail that ends back on the Moon trail. From this point it became a flowy downhill that feeds back into the Boot trail and really starts to get fun. Our speed slightly increased as we headed down to the creek beds and back to the campsite for a quick five minute rest before we conquer the South Loop. We started off by hitting the jeep road to the start of Lisa Ln. trail. Actually we started off by fixing Ali’s rear tire. Flat as a pancake. New tube was holding zero air. After further evaluation there was a whole at the base of the valve stem. No bueno. Mike double checks the tire, inserts a new tube and now we’re off. Lisa Ln is a nice smooth gravel road that goes straight uphill for about 200 yards. Nasty climb. But as the old saying goes “what goes up has to come down” and that is exactly what we did for breif minute on Longhorn. The only bad thing about this is there is a 180 degree turn at the bottom. That’s right folks time to go back up, again. The up part was filled with several rocky techinal areas or as I call them WALKNING sections. But still a blast. We all gather at the top for a brief second and then hit the Armadillo trail down to the creek bed. The creep bed portion is in my eyes the best section of the entire trails system. I could ride there all day!! Don’t know what got into Mike, JP, Nick and myself but we take the creek bed challenge. Sometimes rolling over rocky technical section is easier at speed. It doesn’t feel like your taking all of punishment the rocks are giving. As usual Mike gets to the end of the creek bed first and starts to mess around with a little climb. We all try the section and after one failed attemp I was out. I decide to sit my tired self down on a cool boulder. Within minute we’re all together again just about to continue the ride as Mike takes one more quick spin up the little climb. Bang, Boom, Blam is all I can see as we hear Mikes back wheel slam into a rock. That’s right folks second flat of the day. No worries the rock I was sitting on and the ground where JP was laying down at stayed cool the whole time. Quick fix and back on the bike to cross the suspension bridge and head back to the campsite for a breif break before we hit the final 5 miles fo the day. The last 5 Miles of the day included the longest hill up to the wind mill and longest descent of the day. The windmill jeap road was even more intimidating than Lisa Ln. At least on Lisa Ln you have trees on either side while you are climbing. While riding up the Windmill jeep road it seemed like you were going up to heavens nothing but blue skies. Always a challenge for me but I was able to make it up 150 yards or so before it was time to get off and do a little hiking. Can’t recall who made it all the way up the initial climb. But if you did CONGRATS!!!! At this point we are only 1/3 of the way to the highest point at Camp Eagle. Still a little more climbing before we hit the fastest mile on the trail. But before we get there we stop and check out the New Zip Line. I believe I heard someone says it was the longest in the world or at least in Texas. By now the heat and fatigue factor are starting to take a toll on some of us but we all continue forward. Somewhere along the fence Jonathon has the a flat tire and the third flat of the day. We quickly fix it a try to catch up with the rest of the group. The bad part of this section is that there are now signs or posting indicating you are leaving Camp Eagle property. We’ve missed the turn toward the 1 mile descend before and ended up going up and down hills and crossing a few property lines. It was a great expedition but with it being the first day of deer season we didn’t want to make that mistake again. Unfortunely we made the mistake again and quickly back track and find our turn. We took a few minute to make the turn a little more noticable for future visits. I can’t even explain how fast the 1 mile downhill was. But in Mike’s words: WEEEEE WEE WEE WEEEEEEEEEEEE!!! My max speed for that section was 35.4 mph. Boy was I glad I didn’t have a flat tire or wreck. That was pretty much the end of the day on the bikes. We finish the last mile or so back to the campsite where we grap some grub, rest and change for out trip down to the Nueces River. We take a toll of all the bumps and bruises and It looked like Travis was the winner this time with Jason a close second. We had to cancell any plans we had for Sunday biking because a Pretty Nasty storm hit CE. No worries we ended up taking a 3-4 mile hike on Sunday morning before we hit the long journey home. If you didn’t make the camping trip this time please make sure to clear the schedule next time we plan our next trip. You will not be dissappointed!!! Big THANKS to Mike Record for getting everything organized!!! A short video for your viewing pleasure!!! James Munnerlyn gave us a good recap from the camping trip last weekend. Thanks James! Trail maintenance will be this coming Saturday at 8 a.m..
BTU mowed the levee finally, so you don’t have to ride through tunnels of tall grass, but it does mean the trail is covered in dead grass. We will put a couple people on rake duty to clear the trails off. Blair Witch is a bit overgrown in parts. Justin F is trying to figure out a way to carry some paint on the trails to freshen up the original signs. Check out Camp Eagle Classic Mt Bike Festival over labor day weekend for a good time! As usual, email the group or comment here if you’re interested in attending and looking for someone to carpool/camp with! There is a group of us going to Rocky Hill Ranch Sunday morning – Meeting location (and exact time) will be determined by who all is planning to go/drive. Email the group or leave a comment here if you are interested. The trails on the left side of Lake Bryan are OFF LIMITS for the next SIX WEEKS!! Work is being done on the levee and we have been asked to keep off the trails on that side during this time. Please be courteous to the requests of BTU and stay off the trails over there. For months we have been talking about camping and riding at Reveille Peak Ranch (RPR), well that happened last weekend. Although some of our members have traveled to RPR before – this wknd James, Collin, Mike, Kerry, Gina, Christopher and Joel had the chance to gather in mt bike fellowship and explore all that RPR had to offer. We all arrive at different times on Friday and after getting camp somewhat set up Mike, Collin and Joel took off for a quick ride up to Decision Point, the highest point on the property. After about and hour and half of ridng we arrive back at camp. Only of few minor mishaps but we were all in one piece. Saturdays ride was the longest of the 3 days. A total of three and a half hours of ride time totally 13 miles. 13 miles of climbing and manuevering throught some tight rocky terrrain and a few major drops. But the highlight was when we were all atop of Decision Point as a group. The heat started to play a big role in our ride. So we decided to check outt he Quarry. After a cooling off in the Quarry we all mount up and head back to the single track to the camp site. What a day!! The temperature was 100 with a heat index of 105. We were pretty pooped and decided to call it a day. No afternoon rider for us. Diner and some conversation before we all crashed for the evening. Sunday plans were to ride the Tee Pee Trail , Epic, and the Flow track and that is exactly what we did. With a total of 800 plus feet of elevation gain for the ride and some smooth flow track down hill you couldn’t asked for a better way to end the weekend. Can’t wait till our next camping trip!!!!! A little video from out trip. No footage of TeePee or Epic Trails you have to experience those on your own or our next camping trip. One truck arrived at CBSP around 4:00 on Friday to check-in and get the lay of the land. Parked the truck, loaded three bikes and two bob trailers, then headed off for a 1.1 mile ride to find the Windmill primitive camp site. After a bumpy ride, we located the meadow with big clusters of oak trees and found a spot to call home for the weekend. Got camp set up and were ready for a ride. James and I headed out for some exploring while Christopher stayed back for the other to arrive. The trails starting off were thru the meadows on Lively Loop, then turned into a path thru dense oaks and cedar with some rocks along the way. This was the upper Lemons Ridge Pass. We crossed the park road and onto Cedar Chopper loop. Fun enough, then we hit Old Gorman Road Trail and it was FAST downhill with lots of rock, loose at that! At the bottom we met some nice folks from the Waco Bicycle Club. There were at the park working on the trials and invited us for a group ride on Sunday. What a bonus for us! Running out of light so we headed back along Gorman Falls Trail. That was a bumpy uphill ride. I was wishing forfull suspension! Made back to the parking lot and met up with Greg. He was working on a way to get his gear over to the camp site. I helped him out and we walked it in. Met JP and Travis on the way. They decided to get lost on the way back to the car. Up early next morning for a 2 mile hike before anyone was stirring. We got on the trail by 10:00 and found the Spicewood Springs for a nice bath after a 5 mile ride and half mile hike. Back on the bikes and toward Gorman Falls. The group started breaking up after 5 hours on the trail. We made it to the falls. What a sight that was. Texas? Not sure. I think we were transplanted to a tropical forest. Back to the camp site for some grub. I went for a hike and found two caves only 10 minutes from camp. Rounded up the crew and we went spelunking (sort of). Next morning (after the coyotes went away) we were on the bikes to meet the Waco folks at 9:00. It was great to see some familiar faces from our combined group ride of GHORBA, BVMBA and WBC at Cameron Park a few months ago (January?). We basically rode the same route as the day before, just a little faster and with some great tour guides! Before we knew it, time was up. Had to pack everything up and head back home. But not without stopping in Lampasas for a burger at Storms drive-in. “Bright and Early”, right JP? We started of at 6:00 am on Wednesday. Gina and James rode together and Joel, JP and I were in the silver bullet. We made it to Lajitas with enough time to set up camp and go for a 7-mile ride on the Lajitas Trial, Loop 3 (Joel, JP and I). Boy that was fun! So much fun in fact that we turned around and rode up hill so we could do it again. Swishin, swoopin and a whoopin. Went to sleep early with visions of the Old Ore Road in my head. Up and at it early in the morning to drive over to Big Bend National Park to ride with some 60 other Desert Fest friends. 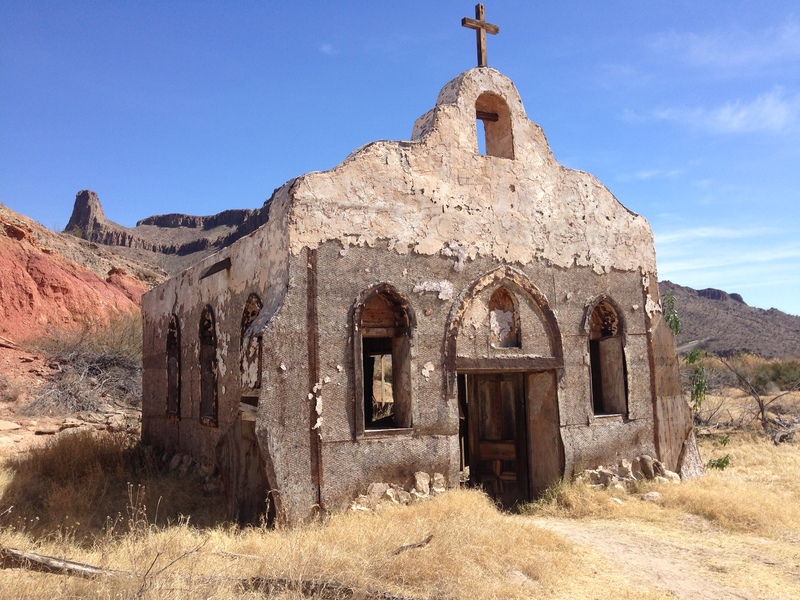 The Old Ore Road is an un-improved rocky jeep road with plenty of big views and not so small sights along the way, including Dead Horse Mountains, Chisos Mountains, McKinney Spring, Telephone Canyon, Willow Tank and the Tinajas. From start to finish was around 32 miles. We had some grinder ups and thriller downs. On one grinder up, Joel (thunder thighs) bent his rear skewer causing the rear wheel to come out of the drops and in turn turning the rear wheel into a taco (true Mexican taco). End of the road for Joel (He made some new fiends in the red sag truck). We made it another 4 miles to the biggest thigh-burner climb out of the canyon to the paved road leading down to the Rio Grande for a dip into the hot springs. I swam way past the halfway point of the river, so I am saying that I visited Mexico! We all found a spot in the pool for a little relaxation. The pool was crowed. Somehow, we missed most of the rain on our ride but got to see the rainbows. After we got back at camp, cleaned up and fed, we watched James play with his star app on the phone. Yep, the stars were big and bright. That did change as the rain moved back in. We had a different show – lightning. Next morning we were up and almost ready to go with the mass of riders (3 big groups) headed to the Lajitas Trail (we were a little late starting). It was a nice 1-mile road ride warm-up to the trails. The leaders wanted us to stay off of one section that was too muddy from the nights rain. We rode loops 1, 2, 3, 4, 1, and 5 to finish it out. Loop 1 is a jeep road – still fun! Loop 2 is a prelude to 3 – FUN. Had way too much fun on Loop 3 (again). When we got to loop 4, I could not stop laughing with joy and pure pleasure (could you hear me say Weee Weee Weeeeeeeeeeeeeeeeee in College Station?). We finished it off on the dashed loop 5. Not quite so fun. Spent some time in the river bed gravel. Made it back to the campsite for lunch. Still did not have enough riding after 22 miles, so JP, Joel and I went on to the Dome Loop at Big Bend Ranch State Park for 18 more miles. This was a preview for the Epic on Saturday. There were a few trails like the Lajitas Trail (swoopy), and some more like Miracle Mile on the Green Belt in Austin (big loose rocks on steep down hill). We found the Crystals on Crystal Trail, Dog Cholla cactus on the Dog Cholla Trial, and the waterhole on the Contrabando Waterhole. Only Bandito was Joel. Lots of big views, including a look at the Cheetos I mean Chisos mountains. We made it back with daylight left and plenty of time to check in with Skip at the Specialized truck and to pick up a few beverages. He let Joel use a back wheel because Joel’s would not go round and round like the wheels on the bus. Skip wanted to make sure the Joel did not taco his rim also. Joel’s new name after this ride was Ballerina because he tippy toed his way thru the rocks with such elegance and ease (no more thunder thigh). The rim was as true as it was when he got it in the morning. We got cleaned up and took a road trip towards Terlingua where the group treated me to a chili cheeseburger at the Starlight Theater for my birthday. The ONLY thing that could have made this day any better for me was to have Debbie and more friends with me! Happy Mike made it back into the tent with visions of tornados and lighting crashing in his head. Oh, wait that really was a tornado that twisted the shade canopy into a mangled mess (just strong winds). Joel, JP, did you hear that? Hear what? They slept thru the entire thing, including Gina, James and I pulling the canopy down the rest of the way. They did not even wake up thru the thunder and lighting. Next morning was a little damp! Gina and James were both too sick to ride. JP, Joel and I arrived 10 minutes early – really, with JP pushing us to go! We met at the Barton Warnock Center with our other +-40 Epic friends for the mornings briefing. Here is the summary of the brief “ride, have fun, drink water and don’t get caught by the grim reaper trail sweeper (Mike with Desert Sports). This was a long day. We started at 8:00 and finished around 4:00? It was a difficult ride with plenty of good and bad moments. Bad = mostly uphill for 32 miles to the Sauceda visitor center with a head wind. Good = the other 24 miles were mostly down hill with a tail wind. Seriously, there was a 5-mile uphill stretch at steep grade (4 mph). One down hill was so long that my braking fingers got tired (yes I used the brakes!). They had 4 water stations with rangers and park volunteers watching people for signs of dehydration. Good thing the water stations were there. It would be difficult to ride only half of this trail with two water bottles AND a hydration pack. After one last big push up hill (top of the world) we were into Fresno Canyon – what a blast! By the end, we were ready to call it a day – no energy left over for side trails. JP did not even have the patience for one last picture (my camera was acting up and he was hungry). Back to the campsite for some stories, serious food and drink – Italian sausage and Tequila Sunset (Patron and grapefruit juice). Up in the morning to pack thing away and say thank you and good by to the desert. One last stop at Fort Stockton for some food and a picture with Pecos Pete. A quick video of The Ore Road Ride and the Lajitas Trails. No footage of The Epic. You’ll have to experience that ride!!!!!!! 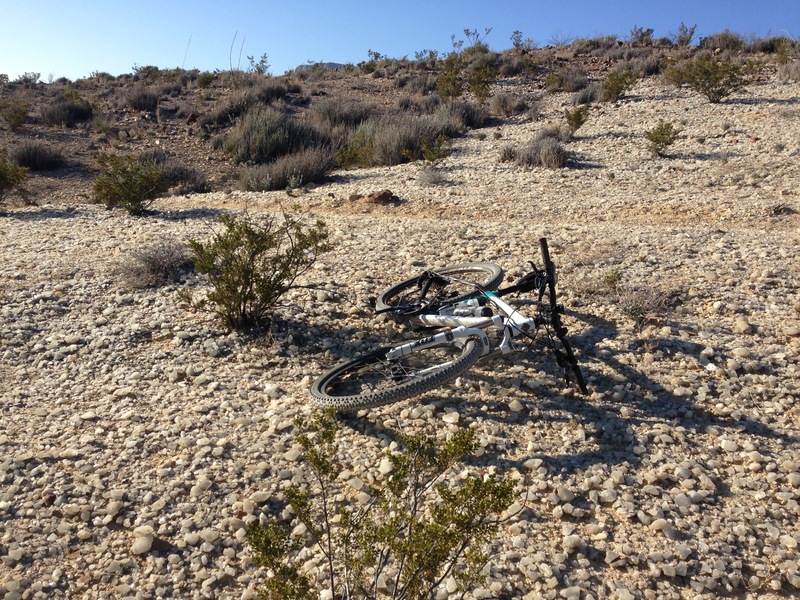 Check out the 3 days in the Desert Summary…….